When travelling with your Hombre washbag, all your essentials are encased in sleek leather which is a beautifully supple yet resilient, natural material. 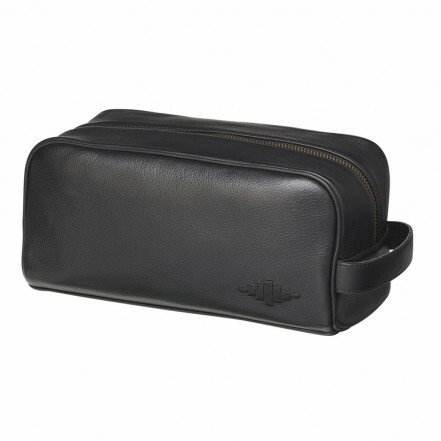 The design is a timeless classic that holds everything you need for long journeys and travel. The interior is lined with blue bandera coloured, genuine suede, which stands out wonderfully. It is a traditional and meticulous vegetable tanning process which gives our leather such a smooth, buttery soft feel. A piece from the pampeano collection stands out because of the attention to detail that our artisans apply, with skills in traditional South American leatherwork and hand stitching that have been passed down through the generations. A perfectly matching pampa diamond has been hand stitched onto the front of the washbag, paying homage to the hand stitching on our iconic polo belts, whose vibrant designs and intricate stitching all tell different stories about the South American lifestyle. • 12cm in height and 11cm wide. • Includes one exterior zipped pocket.